With all the current issues surrounding our federal and state governments, it’s only natural that students would be interested in learning more about how government works. 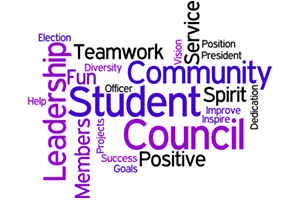 One way to teach students about the workings of government is to establish a Student Council. At St. Joan of Arc Catholic School, the junior high students (grades 6-8) now have the opportunity to be active in their own student government. To run for a homeroom representative or an officer position, students have to fill out an application, which includes getting signatures from their parents and the Assistant Principal. “Students need a certain number of signatures of support from their classmates,” added Anderson. “Once the application is submitted, students create campaign posters to hang around the school, and they give a recorded speech that is shown to the junior high students, who then vote for the officer positions and their homeroom representative.” Students who apply for the election must be in good standing academically and follow school conduct policies.